Life in Māori villages revolved around acquiring food for the community, whether by growing crops, hunting or gathering. The arrival of Europeans – explorers, whalers, missionaries and, later, settlers – led to enormous changes in how Māori lived and worked. Traditionally, the day began early, with prayers and singing to worship the rising sun. hunting moa, other birds or seals. Children and adults worked alongside each other, and chiefs worked together with their people. The first meal of the day was around mid-morning. As the sun began to set, workers returned to the village and food was prepared and eaten together. The rest of the evening was spent in games and conversation. Sometimes there were prayers to the setting sun. Once it was dark, people generally went to sleep. 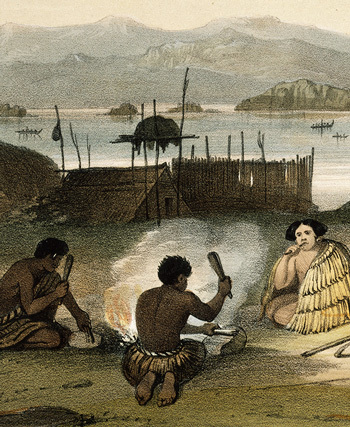 After European explorers and traders began visiting New Zealand traditional life in Māori villages changed. Europeans traded new foods such as potatoes and pigs, and new technology such as iron tools and muskets (guns). This meant less time was needed to grow or gather for the community. The muskets meant that more people died in intertribal wars. Some Māori became involved in trading food, flax or timber with Europeans, which sometimes took them away from their villages. When missionaries arrived, from 1814, many children attended mission schools and learned European concepts of time. Reading became a popular pastime in villages. After wars between government forces and some tribes in the mid-to-late 1800s, some tribes came in closer contact with a European way of life. Other tribes, particularly those who had land confiscated by the government after the wars, returned to more traditional ways of life. Until the middle of the 20th century most Māori continued to live in small rural communities. The marae was still the heart of the community, but work for wages had replaced growing or hunting food. Many people practised both traditional Māori religion and Christianity. After the Second World War many Māori, especially the young, moved to the cities for work. Some returned to their home marae often, while others found community in urban marae, or in gangs. In the 2000s most Māori live and work alongside non-Māori, and they have a similar way of life. However, some aspects of Māori life are still common, and some, such as pōwhiri (welcome rituals) are being adopted by non-Māori as well.